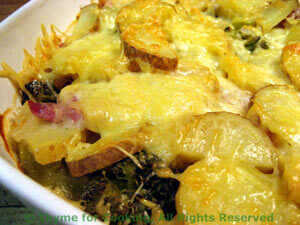 Potato, Ham and Broccoli Gratin, Thyme for Cooking easy one dish dinner. A bit of cutting and slicing, add flour and cover with milk and cheese. What could be easier? An hour later a dinner, piping hot and creamy, pops out of the oven, ready to serve. Cut broccoli into small florets, including stems. Cut the onion in quarters then slice thinly. Slice the potatoes 1/8 inch (.3cm) thick. Cut ham into 1 inch (2.5 cm) squares. Put the broccoli, potatoes, onions and ham into a large bowl. Sprinkle with flour and toss to coat as evenly as possible. Put the whole lot into a large glass baking dish. Whisk the milk and mustard together and pour carefully over the vegetables. Cover and bake at 400F (200C) for an hour or until the potatoes are done. Uncover for the last 10 minutes to brown the cheese. Serve. Note: You could bake it in a slower oven for longer: 350F (175C) for 90 minutes, if that suits your schedule.